Pipeline, a Middle Eastern monthly magazine was established in 1996. 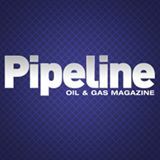 Pipeline prides itself on providing the region’s oil and gas industry with the latest news, analysis, insight and interviews on a monthly basis. Editorial content spans the full range of industry news and features, bringing you market reviews, project insights and profiles of the regional industry’s leading personalities. Pipeline is the official media partner for ADIPEC, the region’s largest oil and gas event, and actively partner with other leading industry events across the Middle East and internationally, bringing you the latest news and views, keeping you ahead of the competition, abreast of technology and in touch with industry trends.